Sela Ann Ward (born July 11, 1956) is an American actress, author and producer, best known for her roles on television. During the 1980s, she played supporting roles in films The Man Who Loved Women (1983), Rustlers Rhapsody (1985) Nothing in Common (1986) and Hello Again (1987), before her breakthrough role as Teddy Reed in the NBC drama series Sisters (1991–96), for which she received her first Primetime Emmy Award for Outstanding Lead Actress in a Drama Series in 1994. Ward has appeared in several films during her career, include The Fugitive (1993), My Fellow Americans (1996), The Day After Tomorrow (2004), The Guardian (2006), The Stepfather (2009), and Gone Girl (2014). She received her second Primetime Emmy Award and Golden Globe Award for Best Actress – Television Series Drama for the leading role as Lily Manning in the ABC drama series, Once and Again (1999–2002). Ward later had a recurring role of Stacy Warner in the Fox medical drama House, and starred as Jo Danville in the CBS police procedural CSI: NY (2010–2013). In 2016, she played the President of the United States in the science fiction film Independence Day: Resurgence, and will star in the Epix political comedy Graves. Ward was born in Meridian, Mississippi, to Annie Kate (née Boswell), a housewife who died of ovarian cancer on February 12, 2002, and Granberry Holland "G.H." Ward, Jr., an electrical engineer who died on January 13, 2009. Ward is the eldest of four children with a sister, Jenna, and two brothers, Brock and Granberry (Berry), III. Ward attended the University of Alabama, where she was Homecoming Queen, a Crimson Tide cheerleader, and joined Chi Omega sorority. She double-majored in fine art and advertising. While working in New York City as a storyboard artist for multimedia presentations, Ward began modeling to supplement her income. She was recruited by the Wilhelmina agency and was soon featured in television commercials promoting Maybelline cosmetics. Ward eventually moved to California to pursue acting and landed her first film role in the Burt Reynolds vehicle, The Man Who Loved Women, released in 1983. Her first regular role in a television drama series, as a socialite on Dennis Weaver's short-lived CBS series, Emerald Point N.A.S., followed in the same year. Ward continued to land guest roles in both television and movies throughout the 1980s, most notably opposite Tom Hanks in 1986's Nothing in Common. In 1991 she was cast as the bohemian alcoholic Teddy Reed on Sisters, for which she received her first Emmy for Outstanding Lead Actress in a Drama Series in 1994. She portrayed Helen Kimball, the wife of Dr. Richard Kimball (Harrison Ford), in The Fugitive, one of the top films of 1993. Ward won a CableACE Award for her portrayal of the late television journalist Jessica Savitch in the 1995 TV movie Almost Golden: The Jessica Savitch Story. Almost Golden remains Lifetime's most watched TV movie to date. In 1995, Ward was passed over for a Bond girl role, learning that even though then-Bond Pierce Brosnan was 42, the casting director said "What we really want is Sela, but Sela ten years ago". In response, she developed and produced a documentary, The Changing Face of Beauty, about American obsession with youth and its effect on women. Later on, Ward would voice the part of former model turned villain Page Monroe in an episode ("Calendar Girl") of The New Batman/Superman Adventures, which focused primarily on the media's obsession with youth. Ward succeeded Candice Bergen as commercial spokesperson for Sprint's long distance telephone service from 1999 until 2002. She also appeared on Frasier as supermodel/zoologist Kelly Easterbrook in the fifth season opener ("Frasier's Imaginary Friend"). When she read for the role of Lily Brooks Manning on the series Once and Again, its creators (Edward Zwick and Marshall Herskovitz of thirtysomething fame) initially deemed Ward "too beautiful" for the average single mother to identify with. Ward received her second lead actress Emmy and a Golden Globe Award. In 2004, she played the role of a private investigator in the television movie Suburban Madness. The same year, she also appeared in the movie The Day After Tomorrow with Dennis Quaid and Jake Gyllenhall. In 2005, she began a recurring role in the Fox dramatic series House as Stacy Warner, the hospital's attorney and formidable ex-partner of the protagonist, Dr. Gregory House (played by Hugh Laurie). In 2006, Ward's character was written off the show. She made her last guest appearance in the House series finale titled "Everybody Dies" which aired on May 21, 2012, as one of House's hallucinations and an attendee at his funeral. Ward was originally offered both the role of Megan Donner on CSI: Miami and Susan Mayer on Desperate Housewives, but turned both down. Ward was reluctant to commit to another lead role in an hour-long series because of the time away from her family it would require. Although she was on a brief hiatus from television she continued to appear in feature films. In 2006 she starred opposite Kevin Costner in The Guardian and in 2009 starred in the thriller The Stepfather. In July 2010, Ward signed on to star in the police drama CSI: NY, at the start of the seventh season. Ward remained on the show until the end of the ninth and final season in February 2013. Ward appeared as newswoman Sharon Schieber in Gone Girl (2014), and co-starred in Independence Day: Resurgence, released June 2016, in which she played the President of the United States, President Lanford. She also plays the leading role alongside Nick Nolte in the upcoming political comedy, Graves. On May 23, 1992, Ward married entrepreneur Howard Elliott Sherman. They have two children. After meeting two foster children during a holiday trip home to Mississippi in 1997, Ward decided to meet a broader need for abused and neglected children by initiating and partially funding the creation of a permanent group home and emergency shelter, as well as transition houses. Hope Village is housed on a 30-acre (120,000 m2) property once used as a Masonic-owned and -operated orphanage, the Hope Village for Children opened in Ward's hometown of Meridian in January 2002 and is intended to serve as a pilot for a nationwide network of similar shelters. Hope Village currently has a capacity for 44 residents and serves an average of 200 children per year. A portion of 22nd Avenue in Meridian (from 6th Street to the Interstate 20 highway interchange) has been named the "Sela Ward Parkway" in her honor. In 2002, Ward published her autobiography, Homesick: A Memoir, through HarperCollins' ReganBooks imprint. 1985 I Had Three Wives Emily Episode: "Til Death Do us Part"
1986 Hotel Isabel Atwood Episode: "Hornet's Nest"
1987 Night Court Heather Episode: "Christine's Friend"
1997 Frasier Kelly Easterbrook Episode: "Frasier's Imaginary Friend"
1999 New Batman Adventures, TheThe New Batman Adventures Page Monroe/Calendar Girl Voice role; Episode: "Mean Seasons"
1 2 "US: Sela Ward joins CSI: NY". The Spy Report. Media Spy. July 14, 2010. Retrieved July 14, 2010. ↑ "Sela Ward Biography (1956–)". Retrieved June 7, 2015. ↑ "Granberry H. Ward, Jr.". Retrieved June 7, 2015. ↑ Ward, Sela (October 2003). Homesick: A Memoir. HarperEntertainment. p. 15. ISBN 0-06-098907-6. 1 2 3 4 "Sela Ward". TVGuide.com. Retrieved December 14, 2015. ↑ "American Profile – American Profile Celebrates The Intriguing People, Places And Things In Hometowns Across The Country Along With Features On Music, Film, TV, Seasonal Recipes, Health And Family Finance.". Retrieved June 7, 2015. ↑ "Lifetime TV Shows - myLifetime.com - myLifetime.com". myLifetime.com. Retrieved June 7, 2015. ↑ "Page Not Found – Toon Zone News". Archived from the original on June 3, 2013. Retrieved June 7, 2015. ↑ "Why Sela Ward won't return to television"
↑ Goldberg, Lesley (May 10, 2013). "CBS Cancels CSI: NY, Vegas, Rules of Engagement, Golden Boy". The Hollywood Reporter. Retrieved December 17, 2013. ↑ Busch, Anita (May 4, 2015). "Sela Ward Set To Play POTUS In 'Independence Day 2'". Deadline Hollywood. Retrieved November 23, 2015. ↑ Lesley Goldberg (October 14, 2015). "Sela Ward Replaces Susan Sarandon in Epix Comedy 'Graves'". The Hollywood Reporter. Retrieved December 14, 2015. ↑ Dotson Rader. "Sela Ward: 'My Journey Has Been a Journey Home'". Parade. Retrieved December 14, 2015. ↑ Guideposts Magazine Archived September 28, 2007, at the Wayback Machine. ↑ "Hope Village for Children". Retrieved June 7, 2015. ↑ "Google Maps". Google Maps. Retrieved June 7, 2015. ↑ DFW.com "Five questions with Sela Ward, the newest cast member of CSI: NY"
↑ Ward, Sela (October 15, 2002). Homesick: A Memoir. HarperEntertainment. ISBN 0060989076. 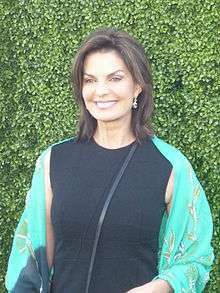 Wikimedia Commons has media related to Sela Ward.